Julie Wrigley has stood for sustainability since before the term existed. 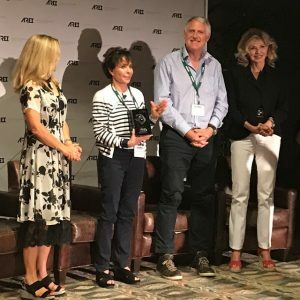 And on American Renewable Energy Day (AREDay), Wrigley was awarded for standing behind the country’s first School of Sustainability, a unit of the Julie Ann Wrigley Global Institute of Sustainability at Arizona State University. Her investment helped establish both the institute and the school, which has graduated over 1,000 sustainability leaders since its founding in 2006. Calling Wrigley a “sustainability pioneer,” Sally Ranney of the American Renewable Energy Institute presented her with the award at the conclusion of an AREDay panel discussion. “She took a huge leap with a lot of her money to get us down the road as far as we are on really educating people and getting [them] degrees in sustainability,” Ranney explained. Before accepting the award, Wrigley participated in a panel discussion titled, “New Territory for Philanthropy: Transformative Investment.” She described to the audience how she went from investment to transformative philanthropy, as well as why she chose ASU. “When I first met the people at Arizona State, I found a place that was willing to do something a little differently. I found a place that didn’t want to just focus on how to say ‘No, we can’t do things in our future,’ but rather how to tear down silos in education, how to bring all these voices that might have been working independently together,” Wrigley said. In recognition of the collaborative effort it took to establish ASU’s sustainability headquarters, Wrigley requested that the award be placed at Wrigley Hall – home to both the school and institute.